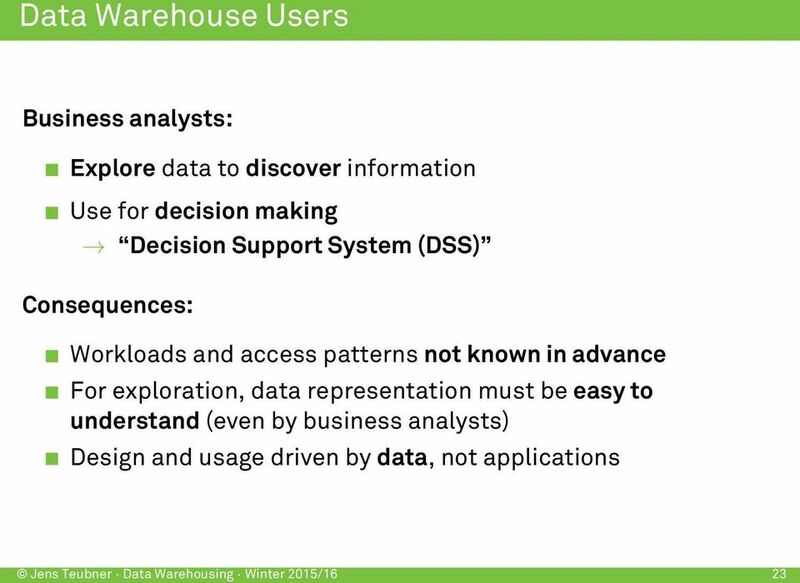 Download "Data Warehousing. Jens Teubner, TU Dortmund jens.teubner@cs.tu-dortmund.de. Winter 2015/16. 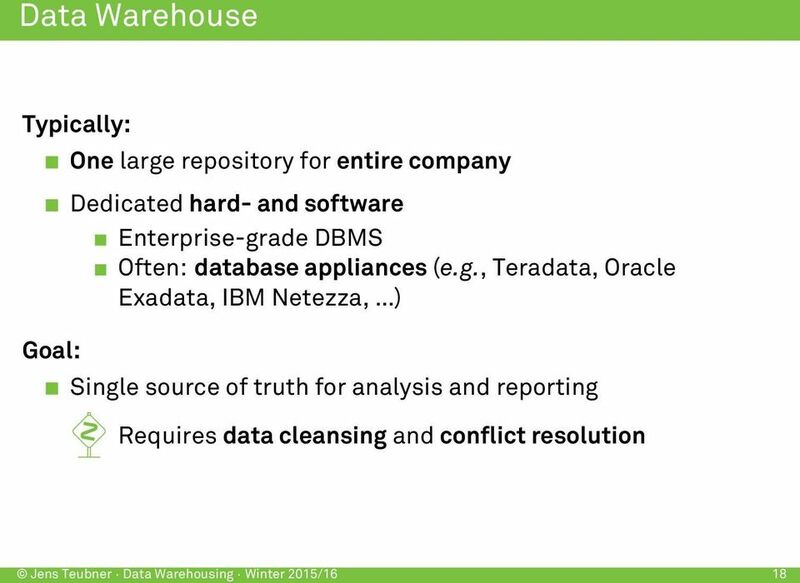 Jens Teubner Data Warehousing Winter 2015/16 1"
3 Data Warehouse Jens Teubner Data Warehousing Winter 2015/16 14 So what is a data warehouse? 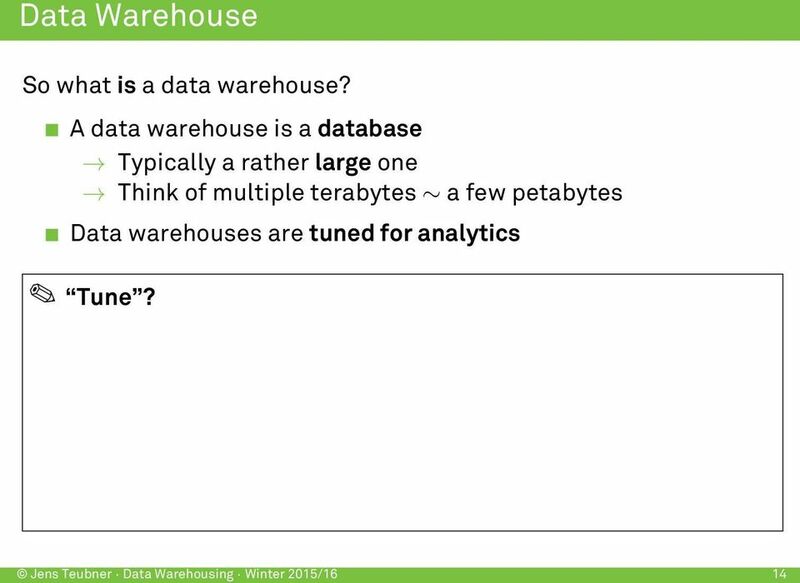 A data warehouse is a database Typically a rather large one Think of multiple terabytes a few petabytes Data warehouses are tuned for analytics Tune? 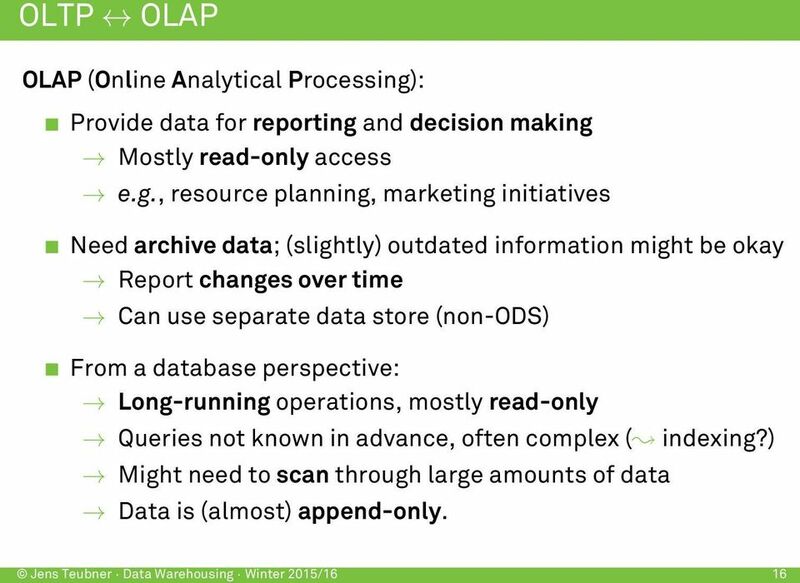 5 Jens Teubner Data Warehousing Winter 2015/16 16 OLTP OLAP OLAP (Online Analytical Processing): Provide data for reporting and decision making Mostly read-only access e.g., resource planning, marketing initiatives Need archive data; (slightly) outdated information might be okay Report changes over time Can use separate data store (non-ods) From a database perspective: Long-running operations, mostly read-only Queries not known in advance, often complex ( indexing?) Might need to scan through large amounts of data Data is (almost) append-only. 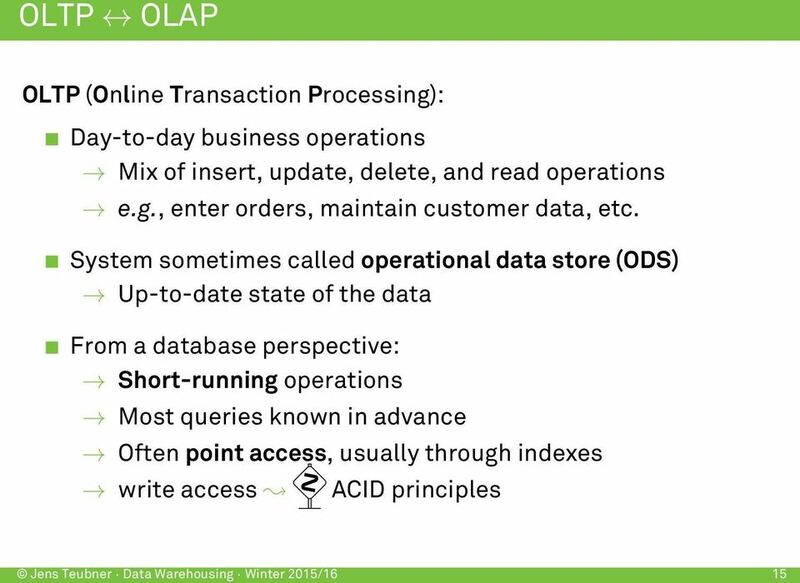 6 Transactional vs. Analytical Workloads Jens Teubner Data Warehousing Winter 2015/16 17 OLTP ODS OLAP DM / DW Business Focus Operational Oper./Tact. Tactical Tact./Strat. DB Technology Relational Relational Cubic Relational Transaction Count Large Medium Small Small Transaction Size Small Medium Medium Large Transaction Time Short Medium Medium Long DB Size in GB ,000 Data Modeling Trad. ERD Trad. ERD N/A Dimensional Normalization 3 5 NF 3 NF N/A 0 NF source: Bert Scalzo. 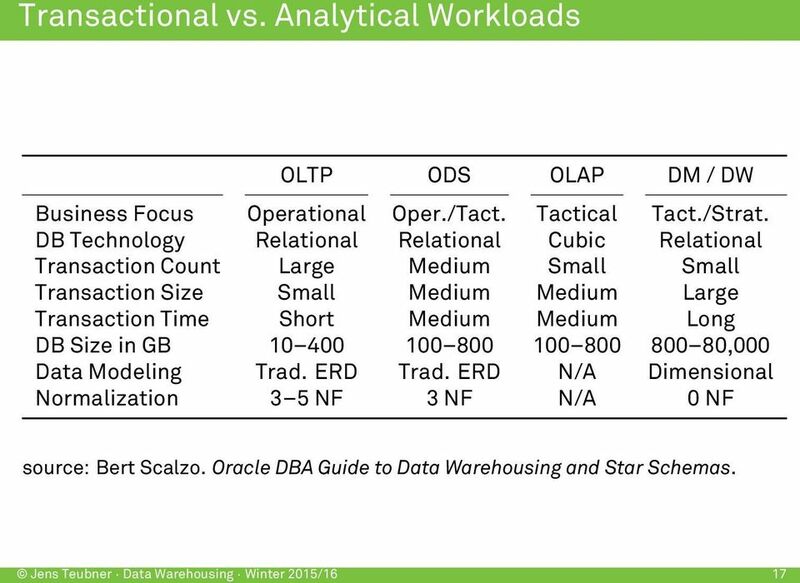 Oracle DBA Guide to Data Warehousing and Star Schemas. 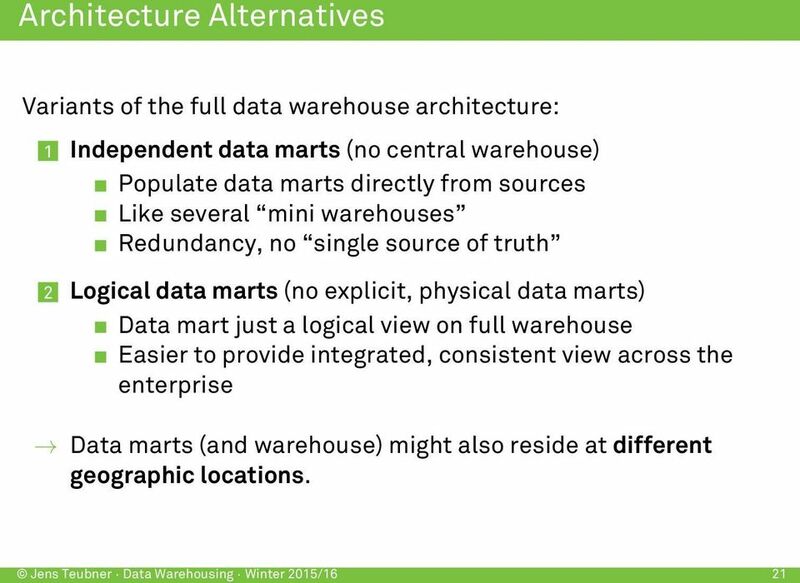 10 Architecture Alternatives Jens Teubner Data Warehousing Winter 2015/16 21 Variants of the full data warehouse architecture: 1 Independent data marts (no central warehouse) Populate data marts directly from sources Like several mini warehouses Redundancy, no single source of truth 2 Logical data marts (no explicit, physical data marts) Data mart just a logical view on full warehouse Easier to provide integrated, consistent view across the enterprise Data marts (and warehouse) might also reside at different geographic locations. 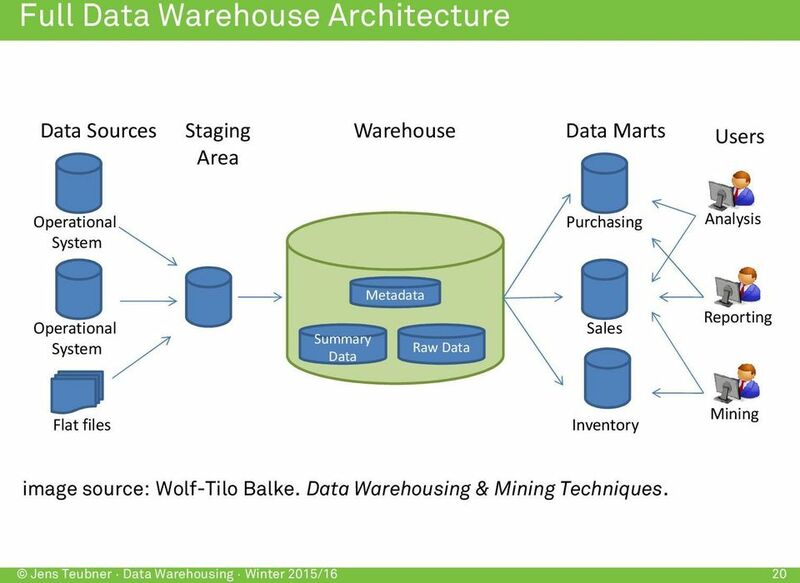 11 Data Warehouse Architecture Jens Teubner Data Warehousing Winter 2015/16 22 Data is periodically brought from the ODS to the data warehouse. 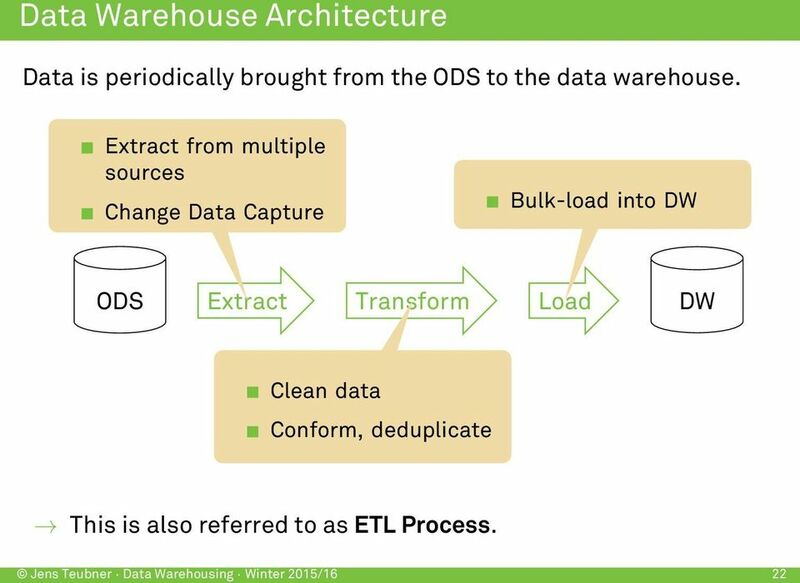 Extract from multiple sources Change Data Capture Bulk-load into DW ODS Extract Transform Load DW Clean data Conform, deduplicate This is also referred to as ETL Process. 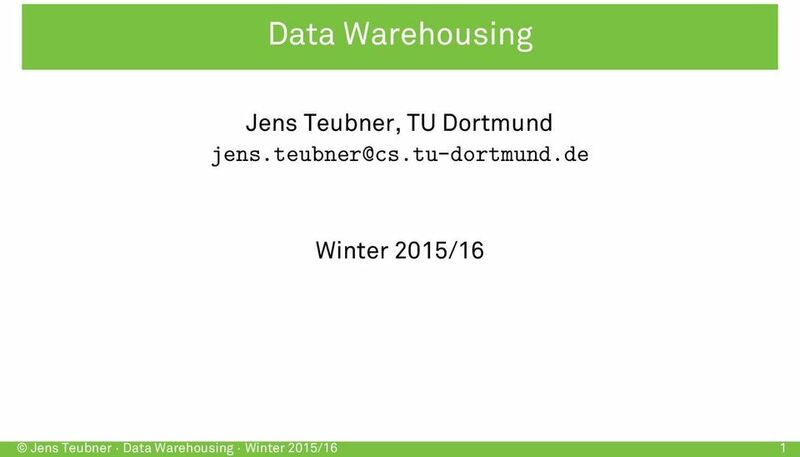 13 Data Warehouse Lifecycle Jens Teubner Data Warehousing Winter 2015/16 24 Technical Architect. Design Product Selection & Installation Growth Program/ Project Planning Business Requirements Definition Dimensional Modeling Physical Design ETL Design & Development Deployment BI Appl. Design BI Appl. Development Maintenance Program/Project Management Kimball et al. 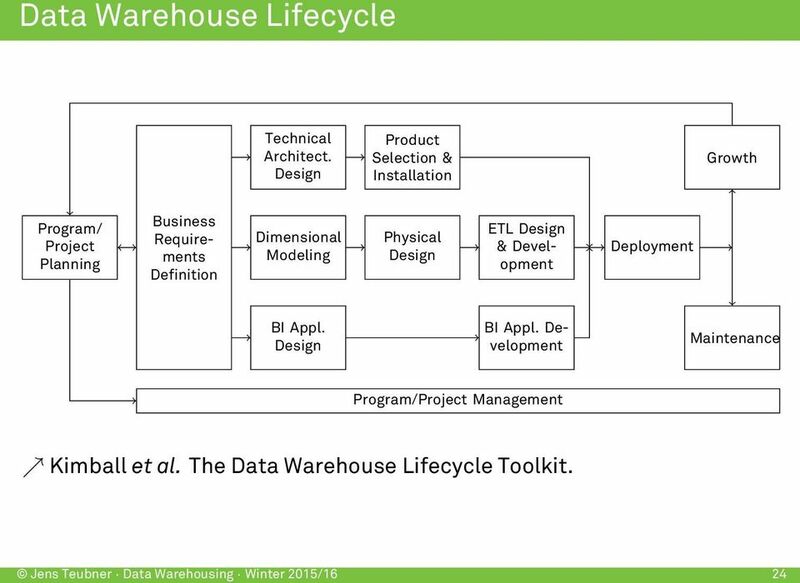 The Data Warehouse Lifecycle Toolkit. EMC CUSTOMER UPDATE. 31 mei 2011 Fort Voordorp. Bart Sjerps. 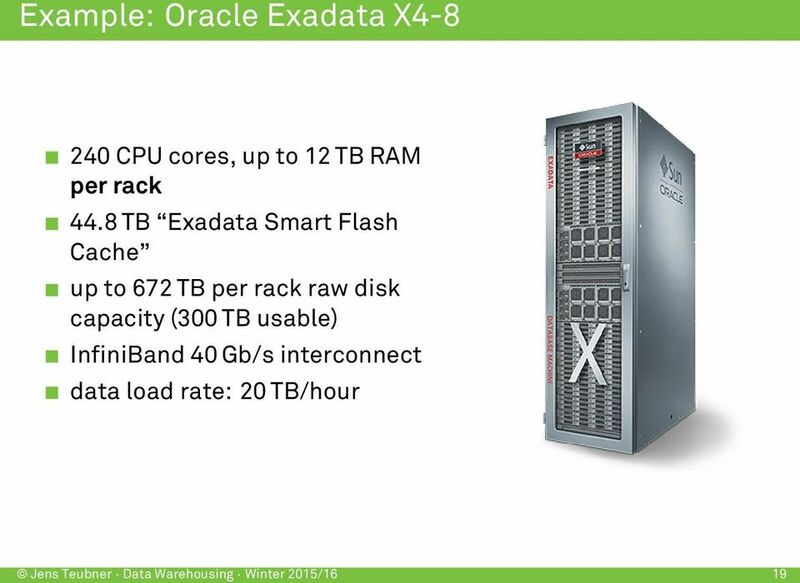 Greenplum Data Warehouse. Copyright 2011 EMC Corporation. All rights reserved. Data Warehousing. Wolf-Tilo Balke Silviu Homoceanu Institut für Informationssysteme Technische Universität Braunschweig http://www.ifis.cs.tu-bs. Oracle BI EE Implementation on Netezza. 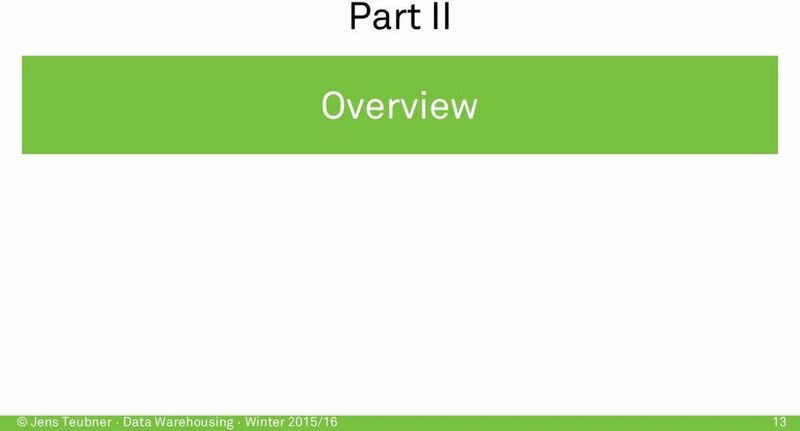 Prepared by SureShot Strategies, Inc.
2.1 Basics: Indexing. 2.1 Primary Index. 2.1 Secondary Index. 2.1 Secondary Index. 2.1 Indexes. 2.1 Indexes 14.04.2009. Advanced In-Database Analytics Tallinn, Sept. 25th, 2012 Mikko-Pekka Bertling, BDM Greenplum EMEA 1 That sounds complicated? 2 Who can tell me how best to solve this 3 What are the main mathematical functions? ?